if you've printed something by mistake! Cancel printing in Windows 10, if you've printed something by mistake, you can cancel it, even if printing has already started. The solution is simple in Windows 10 and also suitable for Windows 7 / 8.1 / 8 and Windows Server 2016/12. 1.) ... Cancel all open Print Jobs on Windows 10! 2.) ... Cancel Print Jobs for a specific printer on Windows 10! 1.) Cancel all open Print Jobs on Windows 10! Pleas open the Windows-10 Service Window via command services.msc over Windows-10 Run Dialog (Windows+R)! 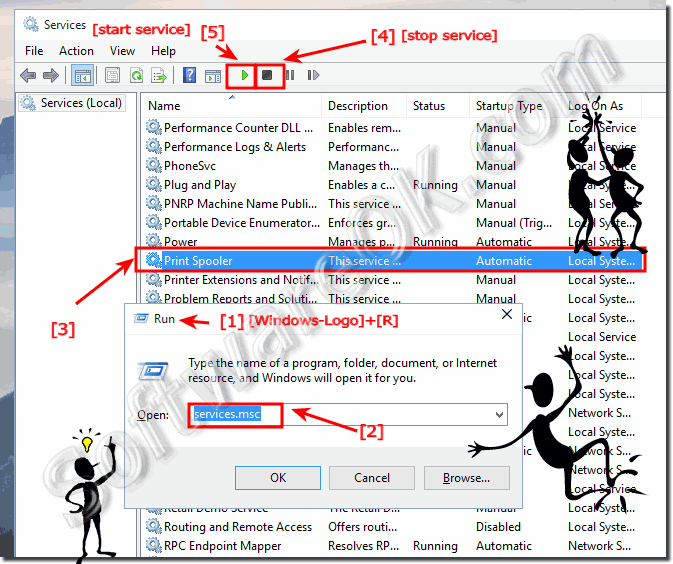 Info: Print Spooler service in Windows 10, spools print jobs and handles interaction with the printer. If you turn off this service, you won’t be able to print or see your printers. (Image-1) Cancel all printing orders in Windows 10! 2.) Cancel Print Jobs for a specific printer on Windows 10! Double-Click (Left-Mouse) the printer that you're using, select the Documents and do a Right click on selection, please select Cancel to cancel / delete the selected print jobs (orders) in Windows -10. You can pause and resume printing a single document—or multiple documents in the queue. If you suddenly realize you're printing in the wrong color ink or on the wrong size paper, you can start over from the beginning. If you're printing multiple items, you can change the order in which they print. 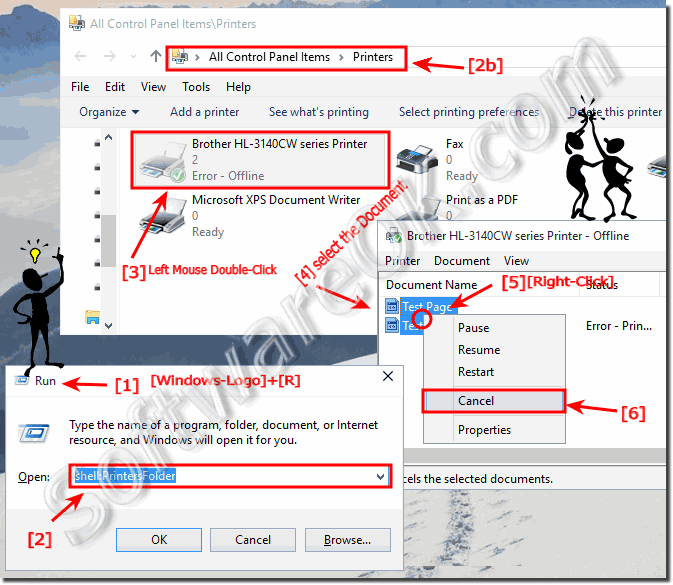 (Image-2) Windows-10 Cancel Print Jobs for a printer! To view your printer permissions on Windows 10, right-click the printer that you're using, click Printer properties, click the Security tab, and then click your user name. After your document or photo has started to print, you can pause or cancel it in the print queue. The print queue shows you what's printing or waiting to print. It also displays handy information such as print status, who's printing what, and how many pages are left to be printedt, and how many unprinted pages remain. See also: ►► Command Line to list / cancel print jobs / Example? Windows-10 - FAQ-108: Cancel all printing orders in Windows 10 via print service?